End the Deportations Now! 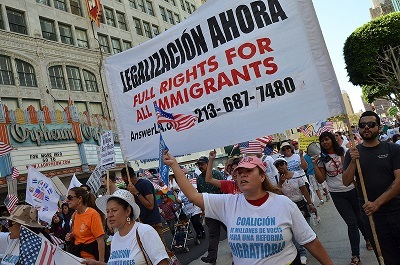 Full Rights and Access to Citizenship for All! BREAKING: Today, immigrants and their supporters are sitting down in civil disobedience, blocking the entrance and exit for deportation vans to shut down Immigration and Customs Enforcement operations. Nine immigrants and supporters are participating in the sit-in. ICE Enforcement and Removal Operations at the Washington Field Office is responsible for processing the detention and deportation of immigrants within Virginia and Washington, D.C. The protest is the latest in more than a dozen dramatic direct actions in the past two months organized by the National Day Laborer Organizing Network and other organizations in cities across the country where participants have used their bodies to block deportations. They point toward the White House's self-imposed deportation quota of 400,000 removals per year and the criminalization programs that conscript local police into efforts to meet it, such as the Secure Communities program, as areas under the President's exclusive authority. "I have DACA [Deferred Action for Childhood Arrivals], but people in my family and so many other people in my community are excluded. It’s only fair for everybody to have the same opportunity because we all came here searching for the same thing." As the immigration debate has winds on without result in Congress, more and more have expanded their search for relief to include the White House who granted it to Dream-eligible youth last year and most recently expanded it to include military families. More than 500 organizations were joined this month by 30 Congresspeople in calling on the President to expand such relief to the fullest amount possible.